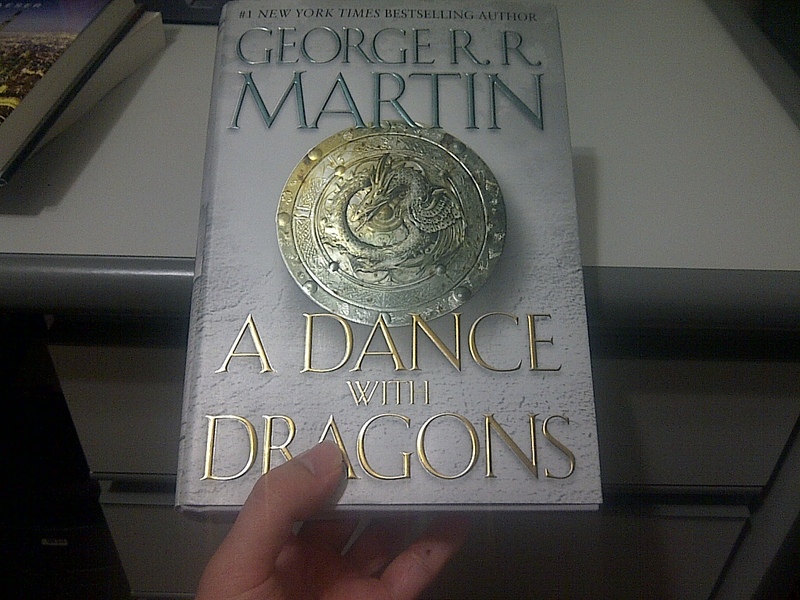 So, George R R Martin has good news and bad news regarding A Dance With Dragons. The bad news is, the book isn’t done yet. The good news is, he’s so close to the finish line that we now have a specific release date – 12 July 2011. I should be excited, but by this point, I’m too firmly lodged in the “I’ll believe it when I see it” camp to get my hopes up. My head knows I shouldn’t get too hopeful. After all, we’ve been here before: GRRM went on a roll in the middle of ’09, and A Feast for Crows came out back in ’05. My heart, now, that’s a different thing. My heart remembers the thrill of buying AFFC for myself, that I bought it on a Tuesday, that it was on my way down to class. My heart is what draws me to click on every ASOIAF-related thread in the hopes that it’ll contain an announcement that ADWD is finished. My heart is what makes me hope that this time, with 8+ POVs already done and good progress made on a particularly sticky plot element (the “Meereenese Knot”), it’ll be for real. Is A Song of Ice and Fire really that bleak? Now that HBO has released a new teaser, a behind-the-scenes video and a “making of” subsite for A Game of Thrones, and since I had my copy of AGOT autographed by George R R Martin today, this seems an opportune time to ask: is A Song of Ice and Fire really as grim as it’s made out to be? I know — this seems like a crazy question at first blush. ASOIAF is one of the defining series of modern, gritty low fantasy. Its signature shtick is that characters who would have escaped the consequences of their own stupidity in any other work, by virtue of protagonist plot armour, here pay the price. GRRM has gone on record as saying that he set out to avoid the “roller coaster” feel of novels that create the illusion that their characters are in danger, but where you know the heroes will ultimately be all right. But stopping there would overlook one vital point. In the novels, trying to do the right thing can get you killed – but when a characters does choose to take a stand, it is held up and celebrated all the same. Characters do change for the better. Life in Westeros is filled with tears – but also moments of joy and triumph. And GRRM has declared his goal of a bittersweet ending, not a horrific one. Compare this with, say, Richard K Morgan’s rage against the world, or Joe Abercrombie’s unrelentingly cynical view of human nature. Who is the bleaker? Author Peter SahuiPosted on September 13, 2010 April 14, 2011 Categories Books, Speculative Fiction, TVTags a game of thrones, a song of ice and fire, agot, asoiaf, fantasy, george r r martin, grrm1 Comment on Is A Song of Ice and Fire really that bleak?